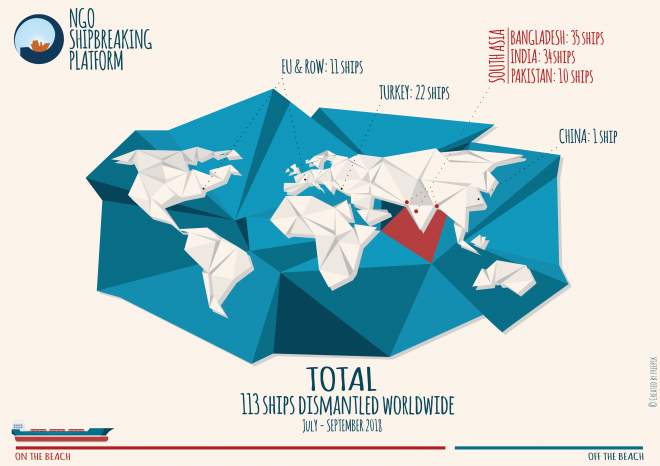 In its quarterly update, NGO Shipbreaking Platform reported that a total of 113 ships were broken in the Q3 of 2018, and 79 of these ships were sold to the beaches of South Asia for dirty and dangerous breaking. Meanwhile, between July and September, three workers have lost their lives in shipbreaking in Alang, India. So far this year, Platform sources have recorded 24 deaths and 9 injuries in South Asia. On 27 August, according to trade unions, Naago Singh lost his life while working at Shri Gaitam Ship Breaking yard, located on the beach of Alang, India. Four days later, workers Budhabhai and Ali Ahmed died at Alang yard Honey Ship Breaking. While cutting the cruise ship 'Ocean Gala' (formerly known as MS Scandinavia and MS Island Escape), they both fell and died on the spot. 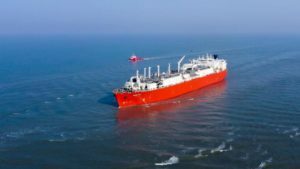 In the third quarter of 2018, US, Greek and Indian ship owners sold the most ships to South Asian yards with 10 vessels beached each, followed by German and Singaporean owners. 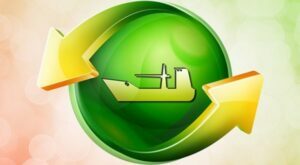 Industry sources report that the South Asian market received fewer vessels in the third quarter due to, inter alia, the monsoon season, Eid holidays and a decline in both steel prices and currencies. Norwegian shipowners continue to sell ships for scrapping in South Asia. No ship had a European flag when it was beached last quarter. No severe accidents were reported in Bangladesh and Pakistan. In Chittagong, a significant decrease in scrapping activities due to the monsoon season and increased pressure for safe working conditions from the Platform’s member organisations on local authorities, following the disastrous accident record of the first half of 2018, have no doubt contributed to a quarter with no recorded accidents. In Gadani, however, a fire broke out in July on the German-owned tanker ADA beached at plot 116. The rescue team successfully evacuated all the workers from the ship. Activities at Gadani continue to take place in breach of decent working and environmental standards. This type of incident could have been avoided if the ban on dismantling oil tankers, which was placed following a series of accidents in 2016 and 2017, had not been lifted in April 2018.